Adam Scott is an Australian professional golfer who plays on the PGA Tour. 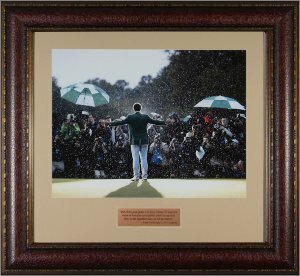 At the 2013 Masters Tournament, Scott emerged from the chasing pack on the final day to enter into a tie for the lead heading into the 72nd hole. Scott proceeded to birdie the 18th from a considerable distance, prompting wild celebrations as he looked to have won the title. However, former champion Angel Cabrera produced an excellent approach and subsequently also birdied the 72nd hole to tie Scott for the lead at -9, leading to a sudden-death playoff. Both players parred the first hole (18) with Cabrera inches away from birdie. On the second hole (10), Cabrera once again missed his birdie putt by inches, leaving Scott a 12-foot birdie putt for the championship, which Scott holed. It was Scott's first major championship and marked the first time an Australian has won the Masters. His victory moved him to No. 3 in the world golf ranking. This 11x14 Photo has Custom Leather Framing.